Equities are small better bid in the euro session following a mixed session in Asia that sees a holiday shorten trading week in Japan. The ‘big’ dollar remains dominate for an eight consecutive session where again Sino-U.S trade talks and Brexit discussions top investors agendas. Chinese Vice Premier Liu He will join U.S Treasury Secretary Mnuchin and trade representative Lighthizer in Beijing for high-level trade talks this week. In the U.K, PM Theresa May is seeking more time to renegotiate Brexit talks, while stateside, another U.S government shutdown over funding remains very much on the agenda. Crude oil and gold are a tad softer on a stronger greenback whilst sovereign yields are little changed. On tap: Mid-week, eurozone data this week (Feb 13 & 14) will be watched for any recessionary clues. On Tuesday (Feb 12) RBNZ will hold its first meeting of the year and ‘dovish’ talk will be sought, while Sweden’s Riksbank is expected to keep interest rates on hold Wednesday (Feb 13). 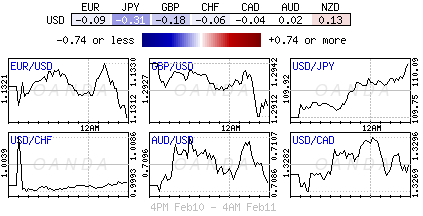 Elsewhere, GBP inflation, CAD trade balance, USD GDP, inflation & retail sales, USD PPI (Feb 14), GBP & USD retail sales (Feb 15). Note: Japan was closed for a national holiday. Down-under, Aussie stocks retreated overnight, as a rally in resource stocks was offset by declines in financials and healthcare equities. The S&P/ASX 200 index closed down -0.2%, while in S. Korea, the Kospi index closed +0.17% higher. In China, regional bourses played catch-up after a week-long Lunar New Year holiday break. Gains came as the commerce ministry indicated that retail earnings during holiday season would increase by +8.5% y/y, and this despite domestic growth being under pressure. At the close, China’s blue-chip index rallied +1.6% while Shanghai’s composite climbed +1.2%. In Hong Kong, at the close of trade, the Hang Seng index was up +0.7%, while the Hang Seng China Enterprises index gained +0.6%. In Europe, regional bourses trade higher across the board after a flat close stateside on Friday and a mixed session in Asia. U.S stocks are set to open in the ‘black’ (+0.36%). 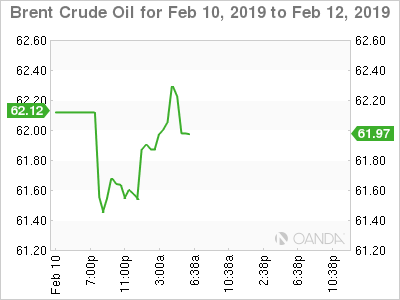 Oil prices are starting the week under pressure as data Friday showed that drilling activity in the U.S picked up and a refinery fire stateside (in Illinois on Sunday) has resulted in the shutdown of a large crude distillation unit. Also, global growth worries are also helping to curb fuel demand. Brent crude oil futures are down -27c, or -0.4%, at +$61.83 a barrel, while West Texas Intermediate (WTI) crude futures are at +$52.17 per barrel, down -55c, or -1% from Friday’s close. In the U.S, Baker Hughes data Friday showed that energy firms last week increased the number of oil rigs operating for the second time in three weeks. Companies added seven oil rigs in the week to Feb. 8, bringing the total count to 854 – this would suggest an increased rise in U.S crude production. And another factor weighing on oil prices this month has been a stronger U.S dollar. 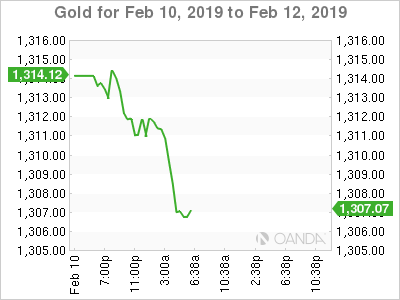 Ahead of the U.S open, gold prices are little changed, supported mostly by uncertainties around the Sino-U.S trade war and concerns of slowing global economic growth, while a strong U.S dollar weighs on the ‘yellow’ metal. Spot gold is steady at +$1,308 per ounce, while U.S gold futures are also firm at +$1,312 per ounce. Safe-haven government bonds have benefited the most on growing investor anxiety over the global outlook, with German and Japanese debt yields falling to their lowest in over two-years. Germany’s 10-year Bund yield is just +8 bps away from “zero” percent. Analysts note that its “now in territory that reflects dire concern about economic conditions.” The yield fell as low as +0.77% on Friday, its lowest since October 2016, reflecting dire concern in bond markets about economic conditions. Despite weaker eurozone growth data and inflation the prospect of another U.S government shutdown and continuing Brexit discussions are also weighing on investors risk appetite. Elsewhere, the yield on U.S 10-year Treasuries has backed up +1 bps to +2.64%, the first advance in a week, while in Italy the 10-year BTP yield has gained +2 bps to +2.983%, hitting the highest in two-months with its fifth consecutive advance. The EUR (-0.17% at €1.1300) starts the week a tad softer and is currently testing the lower end of its €1.1300-€1.1500 trading range. With increasing talk of a slowdown in Europe the markets focus will be on German data on Feb 14 – just how bad are things in the eurozone’s biggest economy? 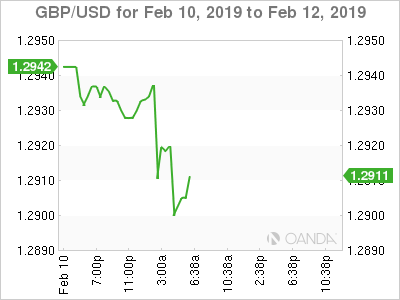 GBP/USD is softer by -0.3% at £1.2897 with the continued Brexit issues remaining ‘front and center.’ The market expects PM Theresa May to request more time before she puts her deal to a fresh vote in Parliament while she has more talks with the E.U. The pound has also come under pressure from this morning’s weaker U.K data – Q3 preliminary GDP, Dec. production data and Dec. trade balances all missing expectations. Note: If there was no fresh meaningful vote by February 27th then PM would allow Parliament to vote on alternatives. 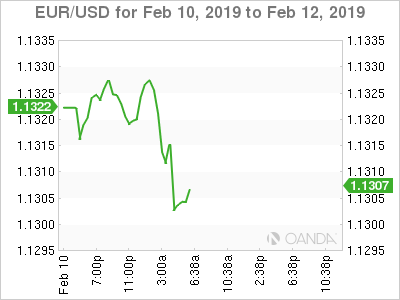 USD/JPY trades above the psychological ¥110 level at ¥110.20 as the market begins the week with a more optimistic outlook of the upcoming US-China trade talks. Note: CHF recreated a “mini-flash” crash at the start of Asian session overnight, supported mostly by the Japan holiday causing an illiquid trading session. Data this morning showed that the U.K economy slowed in 2018 as businesses slashed investment because of the growing uncertainty about the U.K’s exit from the E.U. Note: The BoE has warned that the economy could fall into recession due to a disorderly exit. The ONS said the U.K.’s GDP was +1.4% higher in 2018 than in 2017, the weakest expansion in seven-years. They noted that the economy slowed more sharply in Q4, with GDP rising at an annualized pace of +0.7%, down from +2.5% in Q3. In December alone, GDP fell by -0.4% from November.